Well - having survived Christmas day and planning my NYE celebrations, the few quiet days I have off seem to be a good opportunity to update my last blog for 2008. 2. 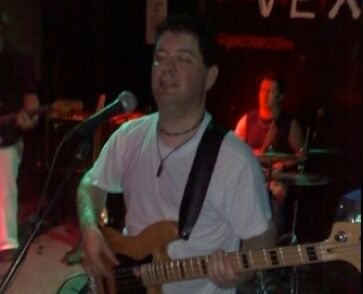 March - I left VEX and was effectively ‘bandless’ - having also just recently left ‘The Shane Diiorio Trio’. Both groups are still going strong and I hope I continue to get to ‘sub’ in every so often. 3. April - I joined a start-up coverband call Kounterfeit and we put together around 28-30 songs, but didnt quite make it to the road. I believe the guys are having another shot, so look our for this great band. 4. May/June - I joined www.fightingforfriday.com.au, another relatively new covers band. These guys are fantastic and I really had a great time playing with them. 6. Aug/Sept - I started a new band called SoulDeep with some players I met on Melband. Again a great bunch of people and some music that is a bit stretching....I think they had their first gig about a month ago. 7. Sept-Oct - I joined www.contraband.com.au and think I have finally found what I have been looking for in a covers band. Nice guys, good music and a pretty healthy gig schedule. I think my first gig with Contraband was one week after my audition, and we are booking up fast in January 2009. Check out www.contraband.com.au (a website that I manage). 8. Oct - Nov - Dec has really been about gigging with Contraband. Im starting to get pretty comfortable with the tunes and have been using our gigs as a way to collect media (video, audio) etc to further develop my web and media authoring skills. GEAR FOR 2009 - Im thinking about maybe picking up another Kubicki bass, as well as a Musicman stingray/sterling and possibly a Yamaha Attitude bass. Of course it all depends what music I am predominantly playing. On the amp front Id like to pick up some of the new Trace Elliot compact cabinets. Thats about it for 2008...2009 is only 5 days away and my first gig is only a couple of days after that so...peace and c u in 2009. Edit 2016 ….. Re-reading this is really interesting for me….I can’t believe 2008 was such a year for start-up bands that never quite made it to the stage. That said, Contraband was one of my favorite bands to play in….Who knows what will happen in the future maybe there will be a chance to jam again with these folks.